MUFE Midnight Glow Palette Swatches: Officially My Favourite Holiday Eyeshadow Palette! MUFE has come out with the Midnight Glow Palette for the holidays, and I am absolutely in love with this palette and it's gorgeousness! I always love MUFE's releases because their makeup is consistently of high quality, and the lovely Midnight Glow Palette is no exception. There's an Aqua Rouge too, in a really lovely universally flattering shade that works on all skintones - but I'll get to that in another post! For today, we're found to be just all about the eyes! 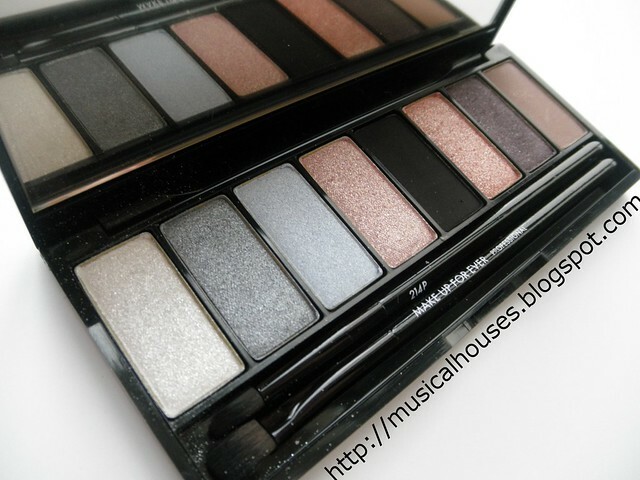 MUFE Midnight Glow Palette: Eyeshadows with glitz and glitter for the holidays! If you're tired of seeing the same few shades incorporated into holiday palette releases, you'll be pleased to know that six of the eight shades are new and exclusive to the palette. The six new shades boast a new "diamond" formula, specially created for an extreme shine. The other two remaining shades are good ol' basics that everyone needs - there's Matte Black and Metallic Taupe 127. One of the things I really like about the Midnight Glow Palette is the great balanced range of shades. There are greys and blacks for a smokey eye look, pinks and purples for a more glamorous look, and blues and whites for the ice queen look. And of course, browns and neutrals for a neutral look. The curation of shades is pretty good, and covers a range of eye looks and a variety of shades. 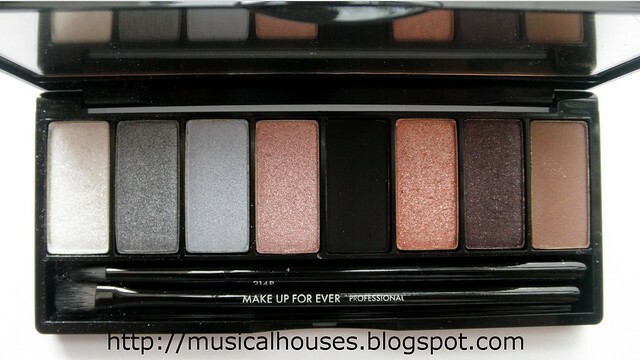 MUFE Midnight Glow Palette: Eyeshadows that cover a range of colour bases and eye looks. And of course, swatches! These have fairly good pigmentation, what you see is probably just 4-5 swipes of product. Most of these shades have a "diamond" finish, meaning that there are bits of sparkle to the finish. The shades are a bit softer in pigmentation compared to MUFE's line of shades, which I'm guessing is due to the inclusion of the diamond sparkle. 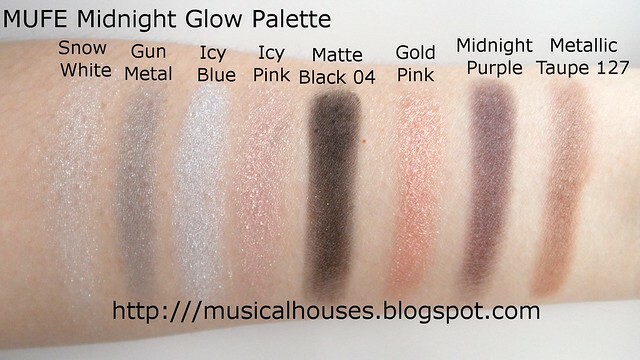 MUFE Midnight Glow Palette swatches: Most shades have the "diamond" finish sparkle, balanced with a couple of mattes. Snow White is a shimmery white with sparkle. Gun Metal is a straightforward gunmetal grey with sparkle. Icy blue is a light pastel blue-grey with sparkle. Icy Pink is a light pastel pink with sparkle. Matte Black is a well-pigmented deep black, and one of the few matte shades in the palette. Gold Pink is a well, gold pink shade. To my eye, it looks like it has some peach too. Also with the diamond sparkle, which looks really pretty in this colour. Midnight Purple is a deep eggplant purple with diamond sparkle. This shade also looks great with the diamond sparkle. Metallic Taupe 127 is also a nice medium brown (the taupe is just a hint to my eye) with a nice satiny finish. All things considered, I think I really like this palette - for me, it's probably THE palette for the holiday season. I love the nicely coordinated wearable-yet-dramatic-yet-festive mix of colours, I love the good quality of the eyeshadows in the palette, and I love that the colours are not just repeats of existing colours in the line (although there is also nothing wrong with that). It's also a pretty value-for-money given the fact that you're getting eight shades in the palette. If you're looking for a palette this holiday season, the Midnight Glow Palette is definitely worth checking out! What lovely shades! I especially love Gold Pink and the Taupe. I definitely love the colours they chose to be combined in the palette! Great find!